IF YOU HAVE BEEN WAITING FOR THE PERFECT KINNAKEET SHORES SEMI OCEANFRONT HOME....YOUR SHIP HAS LANDED. 3200+/-S.F. 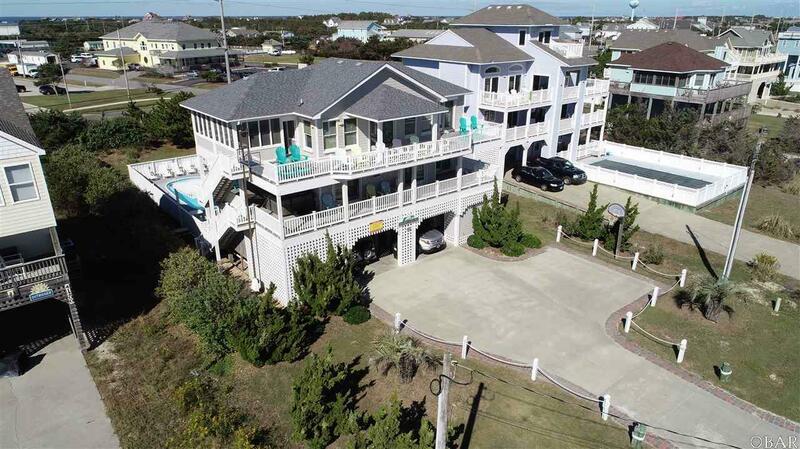 6 BEDROOM 6 FULL AND 2 HALF BATH "RHYTHM OF THE SEA" WITH HEATED POOL, HOT TUB, AND STAIR TAMER LIFT IS PERHAPS ONE OF THE BEST RESORT DESIGNS ON THE BEACH. METICULOUSLY MAINTAINED BY VETERAN HATTERAS HOMEOWNERS, "RHYTHM" HAS IT ALL AND THEN SOME. THE XL COMBO OCEANFRONT GREAT ROOM, WET BAR WITH MINI FRIDGE, STAINLESS KITCHEN, ULINE ICEMAKER, AND DINING AREAS ARE READY FOR YOUR PERSONAL TOUCH. ALL FURNITURE IS TOP OF THE LINE RESORT STYLE. EXTRAORDINARY OCEAN VIEWS AWAIT FROM SUNDECKS, COVERED DECKS, XL SCREENED PORCH, AND THE HOT TUB. GUESTS LOVE THE FULL FURNISHED GAME ROOM WITH FOOSBALL, MULTI-GAME VIDEO MACHINE,WET BAR, HALF BATH, MICRO AND FRIDGE. RENTS ARE EXTRAORDINARY WITH MANY RETURNING GUESTS. OWNERS OPEN SEASON ON MAY 12 AND CLOSE SEPT 18. LANDSCAPED (IRRIGATION) AND SERIOUSLY MAINTAINED LAWN AND PLANTINGS. MORE "BUILT TO LAST" DECK HDPE FURNITURE THAN A STORE. TRANE HEATING AND COOLING HEAT PUMPS. PLENTY OF INTERIOR STORAGE SPOTS FOR THE OWNER AND EXTERIOR STORAGE FOR GUESTS AND OWNERS. WON'T LAST LONG AT THIS PRICE. I HAVE SEEN AND SOLD THEM ALL. "RHYTHM" IS AT THE TOP OF THE LIST. EXTRAS INCLUDE, EXTENSIVE ROLL DOWN SHUTTER PACKAGE, 2 OUTSIDE SHOWERS WITH FOOT WASHERS, C/O DETECTORS ON ALL LEVELS, STAIR TAMER LUGGAGE LIFT, XL WEBER GRILL, CORTEC FLOORING IN FAMILY/GAME ROOM, 7 DOWNCAST LED LIGHTS ON DRIVEWAY PILINGS. THIS IS A HOME WHERE YOU CAN GET YOUR "RHYTHM". BACK.